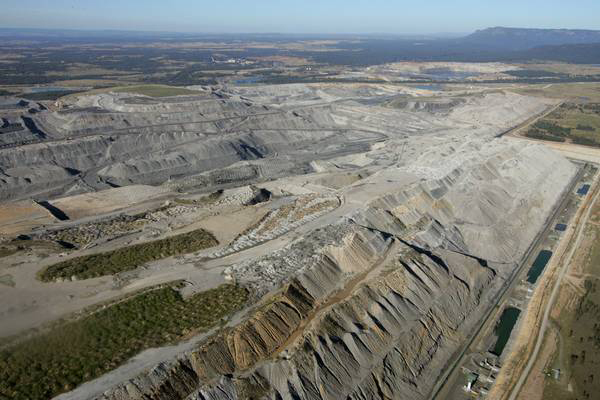 The Mt Thorley open-cut coal mine in the Hunter Valley, New South Wales, whose expansion has been successfully challenged by the community of Bulga. Every week seems to bring a new setback to the global effort to curb carbon emissions. As if we didn’t have enough challenges, now a collapsing European carbon price is threatening the viability of Australia’s own scheme. It can be argued that this shouldn’t cause alarm. Procedurally it would be straightforward for Australia to prolong its carbon tax regime beyond 2015 and to postpone or sever its link to the European scheme. But public opinion, swayed by relentless political opposition, says otherwise. Tony Abbott notwithstanding, carbon pricing is potentially an effective mitigation policy tool. We should all be concerned by the European Parliament’s refusal to back its own scheme and by the turn of this debate in Australia. But we shouldn’t be surprised. This is politics at work. It was politics which first compromised then derailed the Rudd-Turnbull carbon price deal in 2009. It was politics which saw foreign offsets injected into the current scheme, and led the Gillard government to pay coal power generators to continue polluting. For both government and opposition, climate-energy policy is a juggling act in which utterly contradictory concepts are treated as if they’re in complete harmony. The contradictions are at their starkest when it comes to the extraction and marketing of coal, oil and gas. To begin at the beginning: a big majority of Australians agrees with the stated or implied support by both the Gillard and Abbott camps of the UN objective, agreed to in 2010 in Cancún, Mexico, to prevent man-made warming from exceeding 2C. That’s a political figure, by the way. What’s happening around us now indicates that even today’s man-made warming, 0.8C above pre-industrial levels, is damaging the natural order. The Cancún decision was based on science showing that the burning of fossil fuels was the main driver of global warming. To keep warming below 2C, we have to leave most remaining fossil carbon where nature put it millions of years ago — in the ground. Current warming of 0.8C leaves 1.2C more before we reach the limit. But it takes up to 25 years for released carbon to be reabsorbed (mainly by oceans and trees). Even if we stopped emitting now it would still get hotter by another 0.8C. So we’ve already released enough carbon to take us over three-quarters of the way to the “safe” target. What’s left to burn? US climate activist Bill McKibben (who’s coming to Australia in June) cites scientific estimates that to stay below the 2C target, over the next 40 years or so we have to restrict emissions to about 565 gigatonnes, or billions of tonnes, of carbon. Yet despite all efforts, a record level of emissions in 2011 (the latest available global data) indicates that we’ll reach that target before 2030, and by 2050 our emissions will be sufficient to drive warming of 6C. It gets worse. Proven global coal, oil and gas reserves — the amount of fossil carbon which investors in the industry have banked on being extracted — add up to about 2800 gigatonnes. There’s no chance that stakeholders in this industry will vote to lose on their investment by agreeing to leave the resource alone. So we’re committed to extract five times more carbon than our Cancún limit allows us to burn by 2050. By then, it’s fair to assume that most of this will have found its way to the atmosphere. As McKibben says, these are terrifying figures. They ought to scare the pants off every national leader, every legislator, every bureaucrat with any sense of obligation to the well-being of their people and the planet they live on. But they don’t, because an opposing paradigm says that people have a right to the kinds of things that only cheap, abundant energy can bring. This demand, along with geopolitical issues around the supply of energy to major economies, has bankrolled a huge rush for new fossil wealth. Australia is in the pack leading the boom. For the past couple of years, with the full cooperation and sometimes connivance of state and federal governments, mining interests have moved at breakneck speed to explore and extract oil, coal and gas for an insatiable global market. Big prospects for oil from the Cooper Basin are one outcome. Another is the coal-gas boom, with current licences for these resources now covering 437 million hectares of Australian land — more than half of the continent. Despite all the heavyweight backing, things haven’t gone smoothly where fossil carbon deposits underlie farms, such as on Queensland’s Darling Downs and in the Hunter Valley of NSW. Farmers and communities feeling the impact of intruding miners have joined forced with conservationists in the “Lock the Gate” movement, which has fought a running battle to stop the advance of coal-seam gas explorers and miners. Finally, one of these communities has had a win. Early last year Bulga, a tiny village near Singleton threatened by a coal mine expansion, took legal action to stop the miner, Coal & Allied, from going ahead. Last week in the NSW Land and Environment Court it won a landmark victory. Predictably enough, Coal & Allied’s parent company, the global resources giant Rio Tinto, said the decision put 1300 mining jobs at risk. It brings to mind the disappointment of WA premier Colin Barnett at Woodside’s announcement that it was abandoning the huge, emissions-intensive James Price Point gas processing plant. Desperate for jobs and growth, governments tend not to discuss the connection between skyrocketing global emissions and burning or exporting fossil carbon, or talk about food production in the same sentence as coal and gas mining. It’s time they did, along with the rest of us. This entry was posted in agriculture and farming, Australian politics, business, investment, employment, carbon, carbon emissions and targets, carbon offsetting, carbon pricing scheme, changes to climate, climate politics, climate sensitivity, climate system, coal-fired, consumption, economic activity, emissions trading, energy, environmental degradation, fossil fuels, gas-fired, growth, human behaviour, international politics, land use, science, social and personal issues, temperature and tagged agriculture and farming, Australian politics, Bill McKibben, Bulga, business, investment, employment, Cancun, carbon, carbon emissions and targets, carbon offsetting, carbon pricing scheme, changes to climate, climate politics, climate sensitivity, climate system, Coal & Allied, coal-fired, consumption, Cooper Basin, Darling Downs, economic activity, emissions trading, energy, environmental degradation, fossil fuels, gas-fired, growth, human behaviour, Hunter Valley, international politics, Julia Gillard, Kevin Rudd, land use, Malcolm Turnbull, Mt Thorley, Rio Tinto, science, social and personal issues, temperature, Tony Abbott, Warkworth. Bookmark the permalink.